Bertucci's Corporation, a casual-dining chain, owns a collection of full-service Italian restaurants that operate under the name "Bertucci's Brick Oven Pizzeria." During the early years of the 21st century there were roughly 80 Bertucci's restaurants scattered throughout the northeastern United States, each of which featured wood-fired brick ovens, which cook hotter than conventional pizza ovens, and served Tuscan-styled food, including gourmet pizzas, salads, soups, seafood, and pasta dishes. 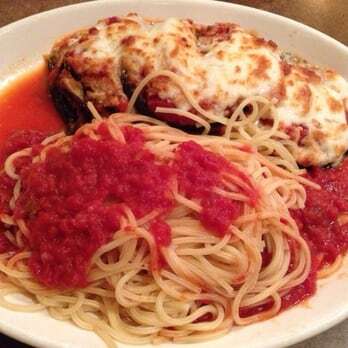 Founded in suburban Boston by Joseph Crugnale, Bertucci's expanded quickly during the 1980s and 1990s, growing from a single restaurant in 1981 to a sprawling restaurant chain by the mid-1990s. N.E. Restaurant Co. Inc., Bertucci's owner since 1998, adopted the Bertucci's name in 2001. A Bertucci's chef shows you how to make the flavored dipping oil that they serve with their legendary rolls. Whisk together the sugar and eggs in a 1 1/2 quart microwaveable bowl. Stir in the juice, zests and melted butter. Cook in microwave on high, stopping and stirring at one minute intervals until the mixture can coat the back of a metal spoon. (It should take less than 5 minutes. It will bubble up quite a bit.) Cool on counter, whisking occasionally, for about an hour. Finish cooling in fridge. Cake: Preheat oven to 350 degrees. Lightly grease and flour two 8 inch cake pans. Set aside. Combine all ingredients in large bowl of mixer and follow directions on package for mixing cake. Pour batter into prepared pans and bake for 28 to 35 minutes, testing for doneness at 28 minutes by first pressing lightly on center of cake with fingertips, then inserting a toothpick in center. Toothpick should have just a slight crumb on it when removed. Cool cakes in pan on counter for 10-15 minutes, then invert and finish cooling on cake rack. Place large mixing bowl and wire whip beaters in freezer for 10 minutes. 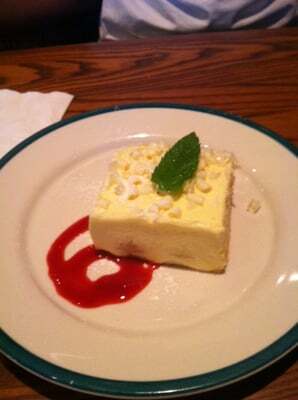 Remove and whip the cream till stiff. Slowly add the sugar and continue beating till stiff again. In separate smaller bowl, by hand or with electric mixer with wire whip attachment, beat the softened cheese and chilled lemon curd together till well combined. Add the sweetened cream and beat again till everything is well blended. Assembly: Cut the cooled cake layers in half horizontally to make 4 layers. Place the first layer, cut side up, on serving plate. Using pastry brush, brush 1/4 of Limoncello (or lemon syrup) onto the cake. Top with 3/4 to 1 cup of the frosting. Place next layer cut side down and repeat process. Frost the outside of the cake and the top. If desired, decorate top using a pastry bag (or resealable plastic bag with corner cut and star tip inserted in cut corner) and star tip. If you do not have a star tip, you can decorate top with chopped nuts, chopped crystallized ginger, or thin lemon slices. Note: The cake should be refrigerated for at least 6 hours before serving. Brush Portabella with olive oil and balsamic vinegar; season with salt and pepper to taste. 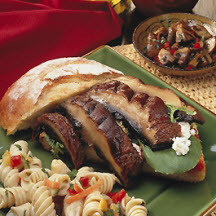 Using metal tongs, place portabella cap on hot grill. Cook 1 minute. Turn and cook an additional minute, until cooked through. Slice focaccia bread open. On bottom half, spread Roasted Tomato Sauce and sprinkle with feta cheese. Moisten top half with pepper juice. Slice grilled portabella cap on bias. Place slices on bottom half of bread, cap side up. Add mesclun. Close with top half and cut panini in half. 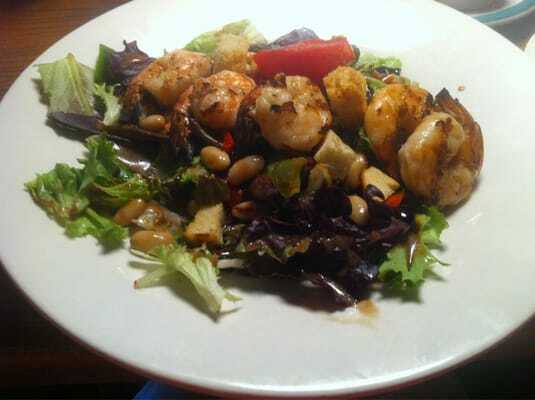 Grilled shrimp served over spinach, roasted artichokes, tomatoes and black olives. finished with melted provolone and served over spaghetti. Romaine and arugula tossed in a Parmesan peppercorn dressing. Topped with seasoned tomatoes, chopped eggs, bacon, gorgonzola, avocado and red onion. 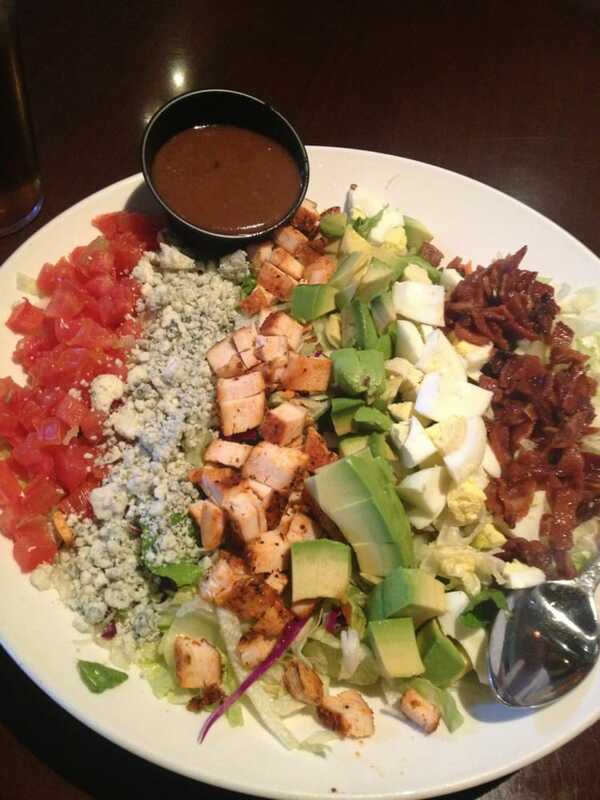 With a choice of grilled chicken, shrimp or salmon. Melt butter in a large skillet over medium heat. Add broccoli and mix. Cover and cook until broccoli is bright green, about 3 to 5 minutes. Add breadcrumbs and mix until incorporated. Reduce heat to low and cook for another 1 to 2 minutes. Serve hot. Bring a large pot of water to a boil over high heat and add 2 tablespoons salt. Add the linguine and stir well. Cook, stirring occasionally, for 8 minutes, or until al dente, tender but not mushy. Try to time it so that the garlic is done when the pasta is ready. While the pasta cooks, place a large skillet over low heat and add the oil, garlic, 1 teaspoon salt, and red pepper flakes. Cook and stir for 3 minutes, or until the garlic softens and then becomes a light golden color. It is important not to let the garlic get too brown as this will result in a bitter, unpleasant taste. Drain the pasta in a colander set in the sink, reserving about 1/4 cup of the starchy cooking water. Add the pasta and the reserved pasta water, a little at a time, to the garlic mixture. Toss well to aerate the pasta, making the sauce slick and creamy. Sprinkle in the parsley, toss well to coat evenly, and season with salt and pepper. Transfer the pasta to a large warm serving bowl or divide among 4 warm shallow bowls. Pass the grated cheese around the table for serving. Notes: This pasta recipe is as simple as it gets. In this timeless Italian peasant dish, hot pasta is tossed with lots of fresh garlic sauteed in olive oil, seasoned with a little crushed red pepper, and finished off with Parmesan cheese. This basic pasta dish leaves much room for improvisation and versatility. Add sauteed zucchini, spinach, steamed broccoli, artichoke hearts, or your favorite grilled vegetables. Snap the tough ends off the asparagus and discard them. Cut the asparagus spears into 1-inch pieces. In a large pot of boiling, salted water, cook the fettuccine until almost done, about 8 minutes. Add the asparagus; cook until it and the pasta are just done, about 4 minutes longer. Drain the pasta and asparagus. Toss with the butter, cream, nutmeg, salt, pepper, and Parmesan. Serve with additional Parmesan. Copycat Recipes for items on the menu at Bertucci's Italian Restaurants.